Maiden Voyage they call it—the first trip in the new RV. My first trip ever in an RV. I was a mess trying to pack the camper and cover all the basis not only for travel, but for the house and pets I would leave. What if I forgot something? What if I caused the house to burn down, the trailer hitch to come undone, the brakes to fail? I’m sitting here at Bay Breeze RV Park in Gulf Shores, Alabama, on Mobile Bay side. I have a pleasant sense of stepping back in time to a tourist court of the Fifties era. The owners treat me like an old friend come to visit. The RV sites, all homey and pleasant, look the same as they would have at a nice, modern camp of that time. A great moss-draped, bent by countless storms, live oak, with some variety of pale green vine growing up it’s trunk shades my travel trailer. Beyond stretched Mobile Bay, it’s waves gently lapping at the shore. There was a lovely breeze this morning, but the heat grows and the breeze withdraws like a shadow, leaving only the humidity hanging in the air, as it does in August throughout the deep South. I think really it could be any year from the 1920s onward. I had come out to sit in the lawn chair to write, but time went by and I didn’t. I found myself leaning back in the reclining lawn chair, looking up into the tree, relaxed in a way that I haven’t known for sometime. I better understand the enthusiasm of all these people who say, “Go RVing.” It is wonderful to be away from the day to day—not having to look at the lawn that constantly needs mowing, the mother who needs care, the household accounts and repairs, and on and on with an endless list of the everyday struggle of daily living. I realized I felt more relaxed since my husband’s illness. Since I entered an alone life, where I am a super-responsible woman going forth with her sword drawn to slay every threat of life on earth. I am responsible for keeping myself up when I am down, for getting my own tea when I feel I can’t go another step, or when I might want to shoot someone. I am responsible for patching up the house, the car, the pool, and my mistakes. Yes, we are each responsible for these things. But for forty-four years of my life I had what my widowed friend Laurie calls, ‘backup’. I had a partner who came along and helped me shore up, as it were, the crumbling and broken parts of life, and who kept away the dragons. And yes, we each have friends and family, thank goodness, and even strangers, who help, but it is not the same as the one person we had in our lives for all those years who helped us get through. The person who had our back for decisions and catastrophes, hopes and joys. The person you could awaken in the night with any of these. 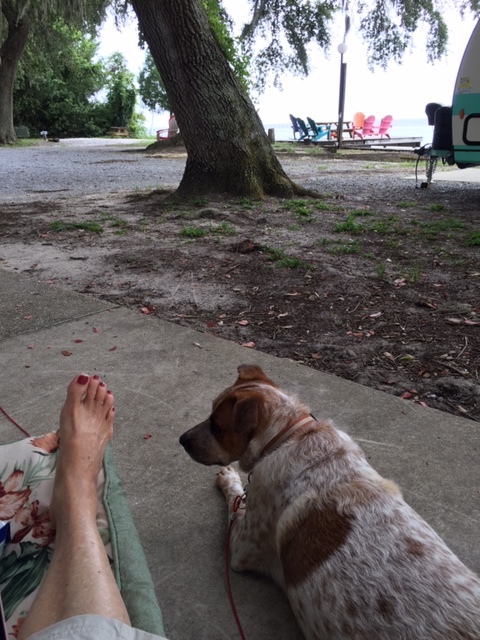 I am grateful for the new friend I have met, Rennie, who came on this first camping trip with me. She bought a Gulfstream Vintage Cruiser from the same dealership where I did. Our meeting falls into the category of ‘God deal’, meeting on Facebook because of our purchase and love of these little retro trailers and discovering we live only thirty minutes from each other. I had fully intended to come on my first camping trip by myself, but when Rennie found out, she said she was coming too, and even jumped in to book at the same RV park. She has RVing experience. She has camped with her husband and with groups of other women. Thinking of it now, I see that in this instance, Rennie stepped in to have my back. I’m finding that help comes from quarters I never would have imagined. This weekend alone, I have had Rennie’s company and tips—“Forgot to bring in your awning,” when we went to a restaurant (never leave an awning unattended in the quick-summer-storm area of the Gulf Coast). There was the patient man who guided me in backing the trailer into the RV spot and who made sure I could unhook. I hadn’t expected him. There were countless friends and family who texted and posted their encouragement of my venturing out into life unknown. Maybe I can let myself relax more often. Looking back over the course of my life, I see that help has come many times, often before I knew I needed it. I am not really as alone as it has felt. Maybe it’s time that I actively choose to rely on this helping hand, and trust that He always has my back. I just never know what the help might look like, but that’s okay. That’s called faith. Love you CurtissAnn. You are such a strong woman!! Your faith is going to take you many places!! God Bless you. There really is nothing else but to keep going, is there? Just as you do. You are a strong woman, as well, dear friend. Love you! I LOVED reading this. You captured some powerful and wonderful feelings and images here. And captured the transition to a new way of being in the world that many of us are experiencing. I look forward to camping with you sometime! One of the most delight facets of this RV passion is meeting interesting people. I look forward to a meet- up with you, too! Carolyn, you are so right that we all are stronger than we know. One of the great challenges in my life is to find the balance of my limits. There are things I cannot do, and it is helpful to admit, either ask for help or let them go. Maybe the act of living is the discovery of our limits and strengths, which is the discovery of our true selves. Thank you for sharing your wisdom and love. Much love back to you, Annie. You are an inspiration to me! Diane, your words just jogged my memory. I have been formulating a story–can’t help it– and this place is the perfect setting! Anna, I am sifting and sorting what I can and cannot do. I can tell you that I am anxious about so much of this. I keep praying and where I feel peace, I go. I do tell myself it is okay not to do things perfectly. And I don’t have to do what others do, just what I feel I can do. The people at the park are so friendly and helpful. I really enjoyed reading this! It was so heartfelt and touching to read. I’m happy your experience on this very important voyage went well. I look forward to reading more and I’m anxious to read one of your books! Take care my Facebook friend! How wonderful! Love hear it all.So glad for you! Camping is usually the only time I can sit in a lawn chair and do nothing but look around. And I understand about being used someone having your back. I miss that–I probably a;ways will. Even though I have a “village” looking after me, there are times only God can fill that role. However, Look at you now!! You inspire me to save for a little RV or a shaggin waggon or something. Widows rock! What a lovely description of your journey…of several journeys. Touched my heart, as usual, just like your books do. I’m so glad something I wrote touched you. Thank you for letting me know, sweet friend.